I am a creature of habit and my husband even more so. Therefore, there are certain places in the Los Angeles area that we return to time and again. The Queen Mary in Long Beach is one of those places. I honestly think the appeal of the Queen Mary is that it allows visitors to feel like they are traveling back to a time when travel was truly a glamorous event and the journey was more important than the destination. I've said this before, but I definitely think I was born in the wrong time and visiting places like the Art Deco Queen Mary allow me to indulge in the fantasy, if only for an evening, of traveling back in time. Usually my husband and I go to the Queen Mary's Sir Winston's restaurant to celebrate our anniversary, but this time we went for no reason at all except to have a nice view and enjoy a good meal. Speaking of celebrations, check out Ada's birthday celebration post featuring me and some other wonderful bloggers all sporting red shoes in honor of the occasion here. You will notice in the details of my outfit that I am wearing a skirt from J. Crew that features what they call a "Deco Floral" print. It's perfect because, as I mentioned before, the Queen Mary, which first set sail in 1936, has many Deco details and adornments on board. I also am carrying a ship clutch that pretty much looks exactly like the ship. In fact, I even took an Instagram pic featuring me holding the clutch up to the bow of the ship to show the unmistakable similarities. Such a fun location to take photos! I love your outfit! Great colors & such a fun clutch! That clutch is awesome! Haha! You look perfect to enjoy dinner and a view on the Queen Mary. I love the vibrant colors! Everything about this is so fun! I love how you coordinate with the ship (your bag! so great) and the pretty art deco floral of the skirt. And of course the colors are wonderful. So pretty! I love this whole outfit. That place looks gorgeous. I'm in love with the energy, which appears in your photos :). The colours plays a great performance, are good matching and very stylish :). But the bag has been stolen my heart :)! 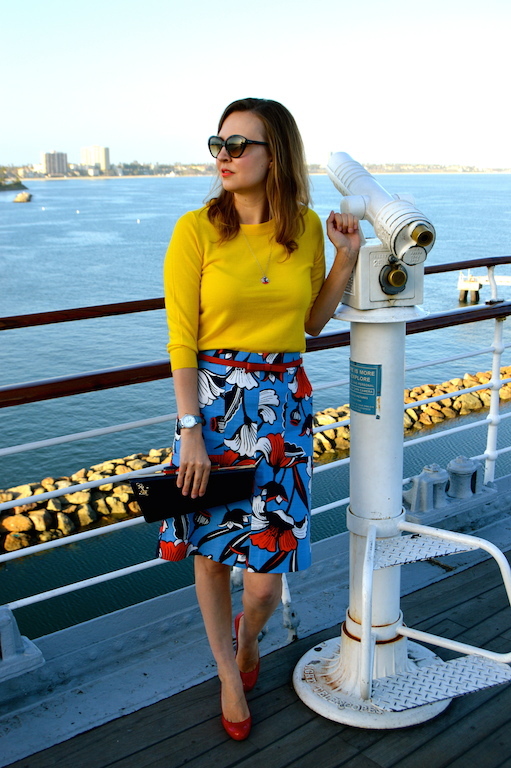 I love that skirt, and the clutch is perfect for dinner on the Queen Mary! You look gorgeous as always. The Art Deco JCrew print is so pretty. I need that skirt. The clutch you chose and pumps were perfect for this outfit and for Queen Mary. Thanks so much for participating in my birthday blog party this year, also. 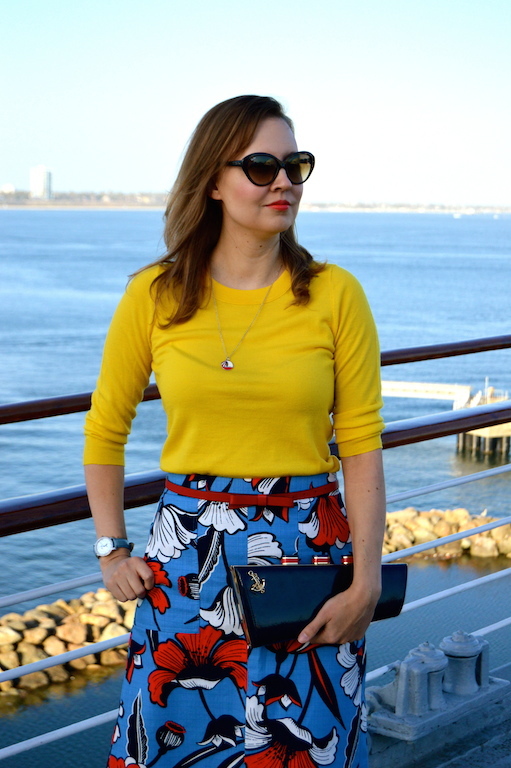 I would never have chosen to wear the bright yellow top with that skirt....until I saw how awesome the combo looks! Great idea! Love it! These bold colors look wonderful together. Such a great skirt with its art deco floral print and your clutch is just too cute! It is just perfect for your venue.